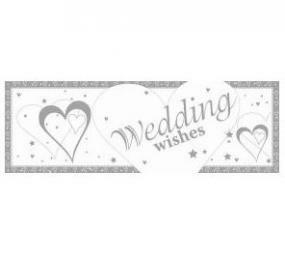 This giant Wedding banner from the Hearts and Stars range is white with a silver print. It is made from plastic and so is suitable for using indoors or out. It has reinforced holes to secure the banner. The banner measures 152.4cm x 50.8cm (60" x 20").